Florida-based construction project sites must use erosion control products to comply with water quality compliance regulations, according to the federal Environmental Protection Agency’s Clean Water Act and Florida state laws. Compliance includes aquiring several local and federal permits. 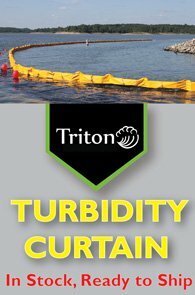 We can help meet those permit requirements with our erosion control products: Triton Type 1, 2, and 3 DOT Silt Curtains, Staked Turbidity Barriers, Coir Products, and Stormwater BMPs. These permits and products, along with knowledge of the state and federal water laws, are essential to avoid significant fines or project shut downs. So, what are these laws? On the federal level, the Clean Water Act (CWA) regulates industrial, construction and municipal activity surrounding lakes, rivers, pond, coastlines and other flowing bodies of water. Before this act was made law in 1972, runoff from stormwater was polluting many U.S. waterways with pesticides, oil, metals, fertilizers, bacteria and other pollutants. The CWA implemented pollution control by setting acceptable standards, making it illegal to discharge contaminants from a point source into> waterways without a permit, and developing a structure for regulating and preventing the pollution. Under the CWA, a National Pollutant Discharge Elimination System (NPDES) Permit was created and is now required. The permit mandates the use of Best Management Practices (BMPs) to prevent the spread of harmful pollutants into public waters. For more information about types of pollutants, please visit our Erosion Control Regulations and Resources page. The benefits of effective management and improved water quality include: protecting public health, flood control, water conservation, and the protection of environmentally-sensitive areas such as wetlands. A Stormwater Pollution Prevention Plan (SWPPP) is also required by the EPA; it is written before a project commences and outlines how a project site will prevent stormwater contamination using erosion control products and proactive procedures. It describes the overall strategy for erosion and sediment control, by detailing potential problems specific to the site and then suggesting concrete solutions. Have questions about our erosion control products? Please contact our sales team at +1-772-646-0597 or request a quote. Florida also has important regulations on the state level. The average 40-60 inches of annual rain that Florida receives increases the potential impact of contaminants entering waterways, making legislation even more vital. In 1982, Florida became the first state in the country to adopt a stormwater law (the State Stormwater Rule) which requires all new development to treat and prevent stormwater runoff using specifically designed BMPs. In 2000, the Florida Department of Environmental Protection (FDEP) was authorized by the EPA to implement and monitor the NPDES permitting for Florida projects. The permit regulates discharges of contaminants and stormwater into bodies of water from construction, industrial and municipal activity. The FDEP communicates the rules and regulations, issues the permits, manages applications and enforces the permits. A project site also must have an Environment Resource Permit (ERP). That permit regulates stormwater quantity and quality and provides environmental protections. It regulates any activity over water or alterations in water flow, dredging, and activities that include runoff. Just like the NPDES, the ERP is regulated by the FDEP. The state’s water management districts also have authority. The Florida Department of Transportation (FDOT) has standard specifications that must also be met. Although it does not regulate, the FDOT follows CWA laws and provides its own measures to ensure that public roadways and waterways are kept clear, functional and safe. It also has specific guidelines for project materials that must be met for FDOT government contracts. Our erosion control products have been designed and manufactured to meet federal and state regulations and FDOT guidelines. Many of these products are manufactured at our Florida-based site and are in stock and ready to ship. Our team can guide you in the right direction as to which products best meet your project’s needs. These floating turbidity barriers stop silt from spreading through a water body. Three types are offered for varying wind and water conditions, and all three meet federal and Florida regulations. Used on land to contain silt, prevent erosion, or mark a perimeter. Biodegradable natural coconut fibers stop erosion on shorelines and in environmentally-sensitive areas. Filters pollutants from stormwater runoff to keep drain systems clear. Visit the Florida Dewatering page for more information.